La Belle Montessori School is a non stock, non profit and non sectarian of learning committed to the development of the children imbued with excellent social values, truth, love of country, harmony with nature, respect of elders, moral character and love for God. La Belle Montessori School was originally conceived and envisioned by the late Atty. Florabelle Tupas, to mold and nurture the inherent talent and ability of the children. after her death in August 5, 1992, her visions, dreams and ideals become a reality when her husband, William B. Tupas, Jr. who was the chairman of the board of St. Anthony School of Las Pinas, decided to establish a sister school at Silang, Cavite. 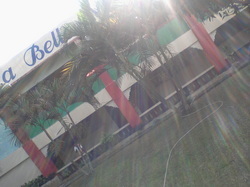 And it is called La Belle Montessori School. In 1998, the Board of Trustees, Decided to establish a secondary course (High-School). It is approved by the Board of Trustees, Henceforth, La Belle Montessori School with limited sources has made a bold step forward unmindful of th insurmountable odds while trudging a thorny uphill road towards the realization of it's Mission Vision of producing on "IDEAL GRADUATES".